This latest adaptation from a work of genius author Stephen King proves to be a missed opportunity. The trailers teased something dark, unpredictable, and memorable, but what we got instead was a terribly written film with poor direction and no attempt to fulfill any promises it sets up. The film has some nice atmosphere building in the start, but ultimately falls into too many horror cliches, like the family moving to a new place for a “fresh start”, and the older, wiser, “exposition dump” character who conveniently knows everything. The marketing not only gave away every surprise there as about the movie, but made me believe this would be a brutal and unsettling horror film. Unfortunately, there are few truly scary moments and every important death happens either off screen or too dramatically to be taken seriously and emotionally. Jason Clarke’s acting never stands out, and he’s an actor who’s unfortunately found himself stuck in the limbo of playing the boring characters in reboots, and like I said, John Lithgow is just there for exposition purposes. There’s also an arc for the female lead which becomes super repetitive and involves unnecessary flashbacks that provide the only possible scares this movie had. There’s also some aspects, like a frightening opening hinting at a cult of some sort or more resurrected animals or people, but this buildup ends up leading nowhere. 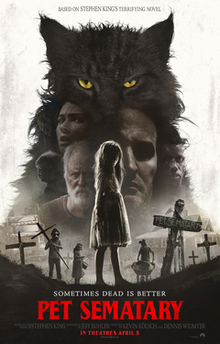 Pet Sematary ultimately becomes frustrating in its climax and I was happy when it was over. It unfortunately fails to dodge any cliches of the genre and misses out on any emotional response it could have gotten out of its audience, which is disappointing because I had hopes for this one. You’re best off watching the trailer and leaving it there, because the 2-minute teaser was far more entertaining than the actual film was. Let’s hope the King adaptations improve when It: Chapter Two and Doctor Sleep are released in the fall.